The major index ETFs are starting off the week teetering between neutral and overbought levels. In the first half of last week, this group had been largely overbought, holding onto these levels until selling in the latter half of the week. Fortunately, intraday strength from Friday prevented the year’s first weekly decline and all of the ETFs from leaving overbought territory. 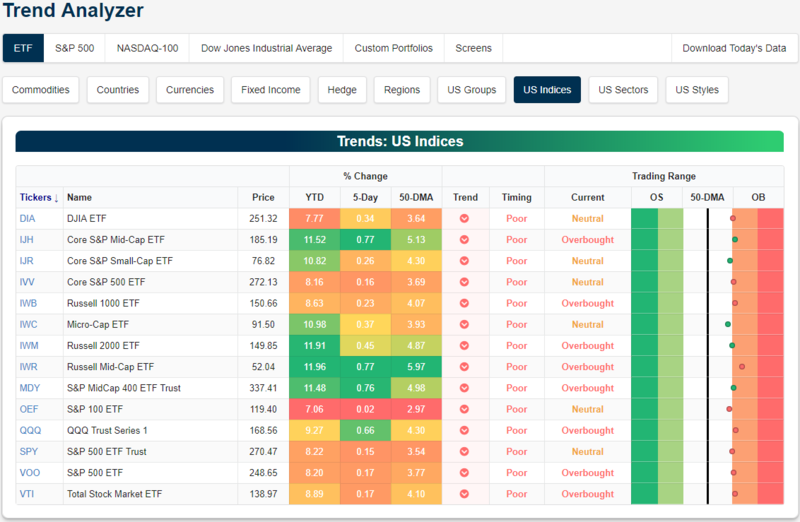 Now there are 8 overbought ETFs while the remaining 6 are neutral, and the Russell Mid-cap (IWR) is the only one firmly in overbought territory. Over the past five days, while small for some, each of the members of this group is in fact in the green. The greatest strength continues to come from the mid-caps as the Core S&P Mid-Cap (IJH), Russell Mid-Cap (IWR), and S&P Mid-Cap (MDY) all continue to outperform their peers. These ETFs are now up just under 12% so far this year and over three-quarters of a percent last week alone. This is more than double (or triple for some others) the gains of a majority of their peers over the last week.